Tehran – There has been much talk in the press of US President Donald Trump’s ‘deal of the century’ which obviously will not include any good news for the Palestinians or the countries of the Middle East. Just recently, Trump recognized “Israeli” sovereignty over the long-disputed Golan Heights, seized from Syria in the 1967 Six Day War. By his move, Trump shoved Arab allies he’s counting on to back his peace initiative into a corner, especially that the Golan decision came after he had already angered much of the Arab world by moving the US Embassy in occupied Palestine to al-Quds [Jerusalem], and cutting off funding for a United Nations agency helping Palestinian refugees. UN ambassadors from France, Germany, Britain, Poland and Belgium said in a joint statement that they don’t recognize “Israel’s” sovereignty over the Golan. The UN Security Council held a meeting last week in which nearly all members rejected Trump’s action. The Arab League closed ranks on Sunday against Donald Trump’s move to recognize “Israeli” sovereignty over the Golan Heights, despite growing tensions between the 22 member states. Media outlets anticipate that Trump will declare ‘the deal of the century’ before the end of April 2019, more precisely after the elections of the “Israeli” government. Some media sources revealed that part of the plan is that he will give the apartheid regime of “Israel” full control over Palestine’s West Bank and permanent presence in the Jordan Valley. There is no doubt Trump will try to woo Egypt’s leader when President Abdel-Fattah El-Sisi visits Washington on April 9 next week, and for sure the American administration will try to justify the Golan policy to allies such as the Saudi kingdom to win back some support. But analysts say it’s unlikely that even Prince Mohammed’s support could help build broader backing in the Arab world especially as Palestinians do not seem to view the US as a traditional mediator anymore. News outlets say that the “deal of the century” is still vague and its main components are yet to be disclosed. However, if we look carefully into the disclosed details so far, the deal seems to have already been revealing. Maybe there will be final touches but nothing much to notice. Trump and Kushner have been gradually revealing the plan. The relocation of the US embassy, the declaration of “Israeli” sovereignty over the Golan Heights, more control for the apartheid regime over occupied Palestine and stunningly the blatant bribery of Palestine and the countries of the region in the form of some 65 billion US dollars altogether in form of economic aid. Sarcastically, the bulk of the money would come from the region’s wealthiest states, so the US milking of Saudis and others continues. This is an effort to buy Middle East countries off to give up their national aspirations. Some analysts who have spoken with White House adviser Jared Kushner disputed those specific figures, but agreed that it would involve tens of billions of dollars to those parts of the region. 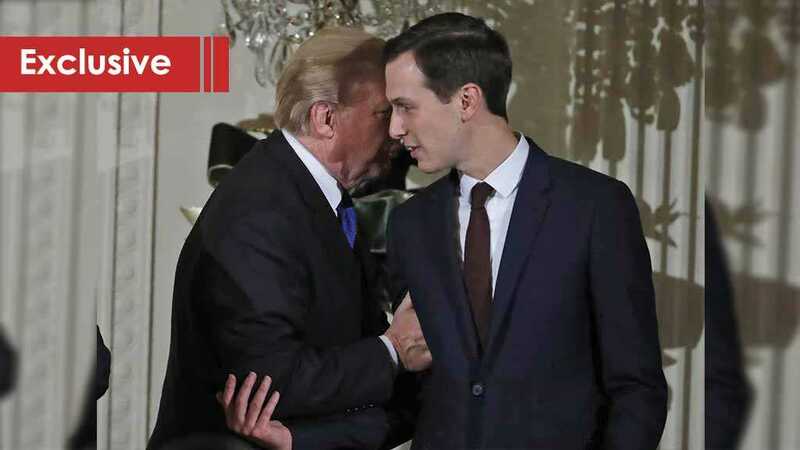 Kushner, Trump’s son-in-law, made a brief visit this week to rally US-allied Gulf Arab allies to support his still – unannounced Middle East “peace plan”. Kushner said in an interview on Monday that Washington would present the “peace plan” only after “Israel’s” election on April 9. The “Israeli” apartheid regime turned the plan into an election issue, with “Israeli” papers focusing on the topic and debating whether the plan is choreographed along with “Israeli” Prime Minister Benjamin Netanyahu and that whether it will be announced the next day after elections. Anyway that is not the core point of the discussion. With all these matters being realized, the US is completing a checklist of “Israeli” right wishes with no consideration of anything that is good for the Palestinians. The refugees question, the future of al-Quds; the future of illegal “Israeli” settlements in occupied territories; and the final borders of apartheid “Israel” and a Palestinian state all go down the drain with Kushner’s bribery of the century, with doubts Arab countries would agree to pay from their wallets to fund themselves and their neighbors. Also, there remains the fact that the resistance forces of the region have vowed that the only way to confront occupation is via resistance, and they are unlikely to back down. Trump and his son-in-law’s plan has already revealed there will be no right of return to Palestinian refugees, no occupying “Israeli” settlements will be removed, more authority for the apartheid regime, normalization of occupation and silencing the region with bribes of economic support. The plan seeks to set up a regional alliance, including “Israel” and some Arab states along with the US, to fight those countries and non-state actors which reject American and “Israeli” policies in the Middle East. It also seems to expect the Palestinians to live in their la-la land of freedom and sovereignty and enjoy their enforced right to remain as refugees for as long as they live. The Arab league has concluded that “Occupation is a crime and legalizing is a sin.” The question that remains is; will Arab leaders really take action when the US attempts to finish its checklist of the deal? If Trump’s foolishness unveils with more usurpation of Palestinian rights, this could be the beginning of a permanent decline of the occupying apartheid regime and of US intervention in the region. If not so soon, eventually the popular will shall rise and cause an irreversible paradigm shift and change the course of events in the Middle East. Abdel Bari Atwan: The Palestinian political scene is in a state of paralysis, which is a direct consequence of the disastrous Oslo process. Mahmoud Abbas (Abu Mazen) is not in good health, so the stage is now set for the post-Abu Mazen period. But nobody has a roadmap for where to go. Abu Mazen is the last of the founding fathers, and his departure will cause the Fateh movement to fragment and lose influence, as happened to the Popular Front for the Liberation of Palestine (PFLP) after the death of George Habash. So chaos and confusion prevail. I wouldn’t be surprised if people in the West Bank and Gaza Strip draw inspiration from the demonstrations in Sudan and Algeria. MA: What about the Palestinians’ right of return to their lands stolen since 1948 and the deal of the century that removes the Palestinian right of return? Has the deal of the century been abandoned or is it still valid? ABA: The ‘Deal of the Century’ cannot be pulled off. The murder of Jamal Khashoggi consigned it to an early death, as it plunged the deal’s broker into crisis. No Palestinian could accept it anyway. The Palestinian Revolution began in the refugee camps. It was all about the right of return. 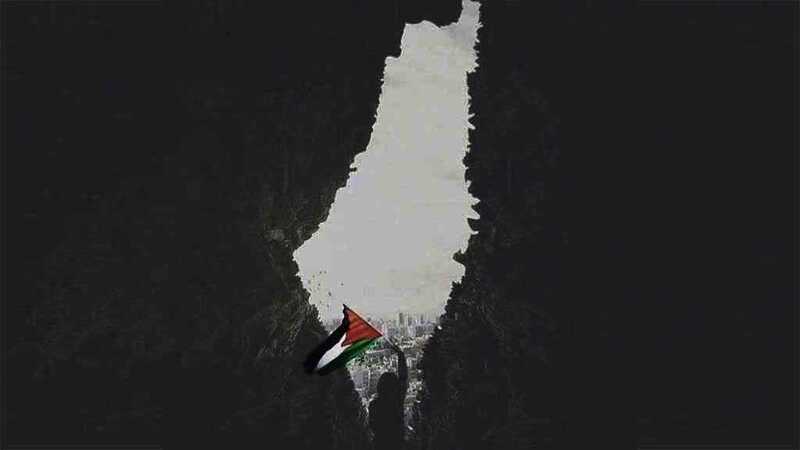 To abandon it would be to abandon the Palestinian cause. That right and others cannot be bought off with promises of investment or improved economic conditions, as the deal proposes. Palestine is not Northern Ireland. MA: How do you explain that at the moment when in Europe and in the USA, we see rising a great critical movement of Israel, like the BDS which advocate different forms of boycott, Arab countries are normalizing their relations with the Zionist and criminal entity of Israel? ABA: These moves towards normalization are not too worrying, as they are confined to the governments and do not extend to the peoples.The peoples reject normalization with Israel, as the cases of Jordan and Egypt show. It’s the same in every other Arab country. Israel is alarmed by BDS and how it may develop in future. This explains its frenetic efforts to brand all criticism and opposition anywhere in the world as anti-Semitic: it fears to become a pariah state and the only way it can avoid that is to criminalize and close down exposure and discussion of its behavior. MA: What is your reading of the Warsaw conference of February 13 and 14, when we saw the alliance between Arab countries such as Saudi Arabia, the Emirates, Bahrain, etc. and the Zionist and criminal entity Israel against Iran? ABA: The Warsaw Conference was a one-man show, starring Israeli Prime Minister Benjamin Netanyahu. It was staged for his benefit, but I believe it was a failure. Its original purpose was to launch a new US-led alliance — a so-called ‘Arab Nato’ — that would act as the spearhead of an international coalition against Iran and include Israel as a member, probably informally at first. But the Gulf States that the US is trying to turn into allies of Israel are not representative of the Arab world as a whole. They account for less than 5% of the Arab population, and their own peoples overwhelmingly reject normalization with Israel. In recent years these states have been able to play a dominant role in the Arab world due to their oil wealth and their manipulation of political Islam. But political Islam has been changing in nature, and the importance of oil in the global energy picture has been declining, so their ‘golden age’ is drawing to a close. MA: How did we get to the fact that some Arab countries come to betray and sell themselves to the Zionist and criminal entity of Israel? ABA: It’s not new, and mainly it’s a matter of perceived self-preservation. Regimes see the goodwill of the US as vital, and Israel as the key to the US’ heart. They talk about a shared interest in confronting Iran but that shouldn’t be taken at face value. Israel talks up the Iranian threat as a way of trying to sideline the Palestinian cause, and the Gulf States do the same to bolster the rule of their regimes. This also entails the poisonous fuelling of Sunni-Shii sectarianism. MA: I did an investigation a few years ago about the activities of the Israeli lobby in Congo. What is your reading of Israel’s strategic redeployment in Africa? ABA: Africa is currently an arena of rivalry for influence and competing interests involving many countries – the US, China, Turkey, Israel, Russia, and others. Israel does not have much to offer Africa, other than political influence in Washington. It is eager to establish a presence and exert influence on the periphery of important Arab countries like Libya, Algeria, Morocco, and Egypt.These countries are all in a weakened state at present and preoccupied with internal problems. But they will eventually recover and their governments will awaken. Sub-Saharan Africa is their natural hinterland and they cannot be prized apart in the long term. MA: The people of Yemen is experiencing a criminal war waged by Saudi Arabia and its allies in total silence. How do you explain this silence of the international community and the media? ABA: The West turned a blind eye to the Yemen war when it was launched four years ago because of Saudi influence and interests. It gave Saudi Arabia a chance to resolve the conflict in its favor. But neither Saudi Arabia nor the West appreciated the nature of Yemen or its people into account. They should have heeded the advice of the kingdom’s founder, King Abdelaziz, who ordered his sons Faisal and Saud to withdraw when they tried to invade the country. The latest war on Yemen has had a catastrophic effect, but in military terms, it has been a failure. The international silence is now beginning to be broken, and I hope that continues. MA: What is your reading of events happening in Venezuela? Do you think that the United States will come to a direct military intervention? ABA: What is happening in Venezuela is a US-sponsored coup attempt and I believe it will fail. MA: There is no longer any mention of the Khashoggi case, which showed the true face of the Saudi regime and raised a worldwide outcry. How do you explain that? ABA: The Khashoggi case is closely linked to Trump’s fate. Trump’s opponents in the US seized on it as a stick with which to beat him, due to his close association with the current Saudi leadership. That’s why there was such an outcry over the killing, however horrific, on an individual, but no similar reaction to Saudi actions that caused thousands of deaths such as the war on Yemen (until recently) and the proxy intervention in Syria. It should not be any surprise, however, that US and Western interests ultimately prevailed over human rights concerns, in this case like so many others. The Israel Lobby has also played a part in suppressing the outcry. But the affair will have a longer-term impact. It laid bare Saudi Arabia’s high-handedness and dominance in the region. MA: How do you analyze the events taking place in Algeria against the fifth term of Bouteflika? ABA: The protests were not so much against Bouteflika as against the ruling elite that was using him as a front and was too divided to agree on a replacement for him, long after he should have been allowed to retire. The powers-that-be made three mistaken assumptions: first, that the fifth term could be pushed through; second, that Algerians would rather have stability than democracy; and third, that the terrifying memory of the bloody decade of the 1990s would deter demonstrations or protests, for fear of repeating what happened in Syria or Libya. They seemed to think, perhaps based on Syria’s experience, that concessions are a slippery slope and not compromising pays off in the longer term. But now they have had to give at least the appearance of backing down due to the strength of popular feeling. The question now is what comes next: a measure of genuine but controlled reform as in Morocco or an Egyptian-style scenario where the army runs things behind a facade of pro-forma elections? MA: Intelligence reports indicate a redeployment of Daesh to Libya. Can we end the terrorism of Daesh and Al Qaeda without really fighting the ideological matrix of these groups? Is it enough defeating these groups militarily? ABA: Daesh is finished above ground in the Arab world. But it will continue to exist underground because the conditions that incubated still exist. In my view, the challenge is not so much to fight the ideology as to address those conditions. The ideology, or at least its adoption or acceptance in some places and by some people, is a product of these ‘failed-state’ conditions and the marginalization they cause. In many cases – Libya, Iraq, Syria, Yemen – they are a consequence, in whole or in part, of direct or indirect Western military intervention. Putting an end to these interventions would be a step to tackling the problem. MA: Are we not witnessing the continuation of the Cold War between the US administration on one side and Russia and China on the other? How do you explain the need for the United States to have an enemy? ABA: The US can’t sleep unless it has an enemy. It has become an obsession, though creating or talking up external enemies has always been a means of advancing the interests of domestic power elites.But the picture is changing. America is no longer rules the world in matters of war and peace. Its real power is not its military might but the US Dollar. Its abuse of its financial and commercial power has become so extensive that an international alliance is taking shape to deprive it of this weapon. Abdel Bari Atwan is a Palestinian journalist born in 1950 in Deir al-Balah, a Palestinian refugee camp in the Gaza Strip. He lived in a family of 11 children. After graduating from primary school in the refugee camp, he continued his studies in Jordan. He then studied journalism at Cairo University. 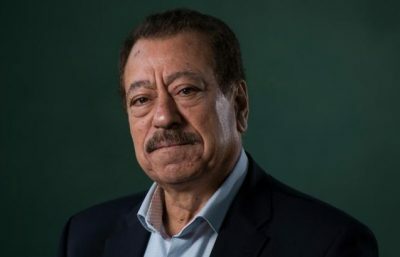 After working for many Arab newspapers, he ran until 2013 al-Quds al-Arabi, a newspaper he founded in London in 1989 with other Palestinian expatriates. Today, he is the editor-in-chief of Rai al-Youm, an Arab world digital news and opinion website. He lives and works in London. “Israel” never gets tired of imposing the same occupation experience. It is stupidity or the nature of tyrants that gave rise – knowingly or unknowingly – to the popular icons that occupy a large portion of the society’s emotional state. The “Israeli” army’s snipers rewrote the details of the story of the Great March of Return. Its heroes are a group of simple people who took to the streets in their thousands on March 30, 2018 to demand their historic right to return to Palestine. This was before the bullets transformed them into unforgettable icons. 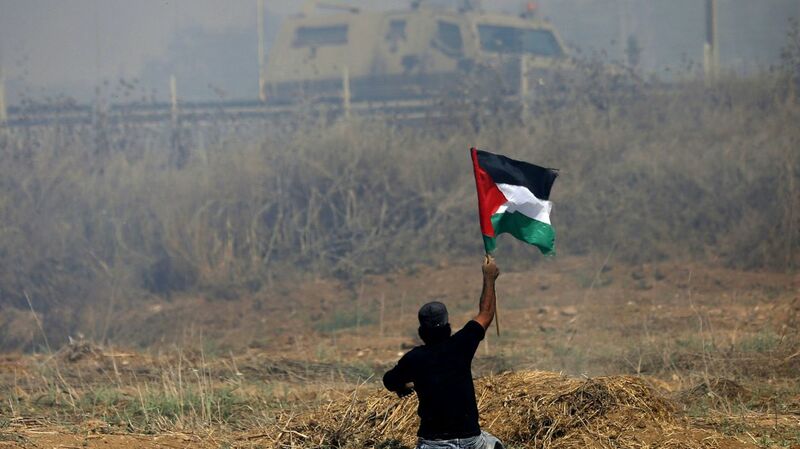 Others are still alive – and so is the resistance. “Even Yasser himself did not expect the ending to be so quick. He might have expected how it would look, but he still had so much he wanted to do,” said a close friend of martyred journalist Yasser Murtaja. Since the first day of the Great March of Return, Murtaja had not left the field. He shot images of what his camera captured and what the snipers hit. The young man spent his 30 years in Gaza, the only city he knew his entire life as he once said. Since the beginning of his career as a journalist, he was able to capture the most beautiful images that reflected his optimism. “Always smiling,” his fellow journalists said, adding that he was one of the few who only had their pictures taken while they were smiling. He also published materials that made people smile but invoked a sense of bewilderment at the same time. In the devastated Shejaiya neighborhood following the 2014 war, Murtaja filmed his documentary, “Gaza: Surviving Shejaiya”. The story revolves around a girl, Bisan, who he rescued from the rubble. A close bond formed between Yasser and her, allowing him to be Bisan’s only friend and companion through the mental and physical rehabilitation that she underwent following the martyrdom of her family. He was an ambitious young man. 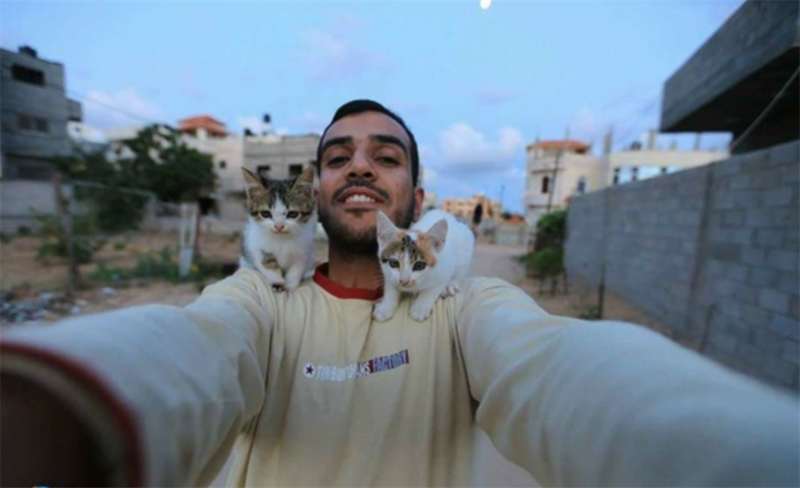 Murtaja was the founder of Ain Media and one of the first individuals to take a picture of Gaza using a drone camera. The residents of the Strip, who never saw their land from an airplane window or from a skyscraper, saw the picture but without knowing it was him who took it. Murtaja was injured on April 4, 2018. Everyone prayed for him to get better. However, he passed away on the same evening to become the first media person to be killed by the “Israelis” in the Great March of Return. His colleagues carried his body as it was photographed using his drone camera. The image of the child, Mohammed Ayyash, aroused the curiosity of various international agencies. 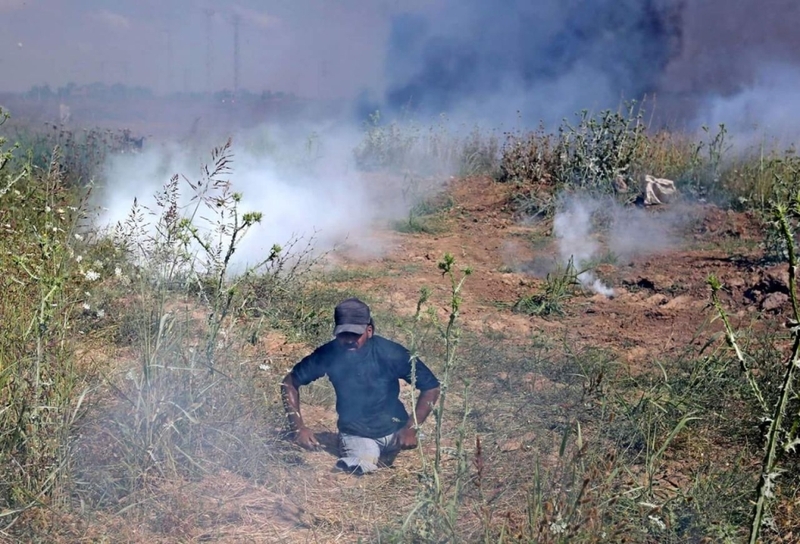 Ayash, who is barely nine years old, filed a patent and an idea in an attempt to overcome the tear gas fired by the “Israeli” army on demonstrators. 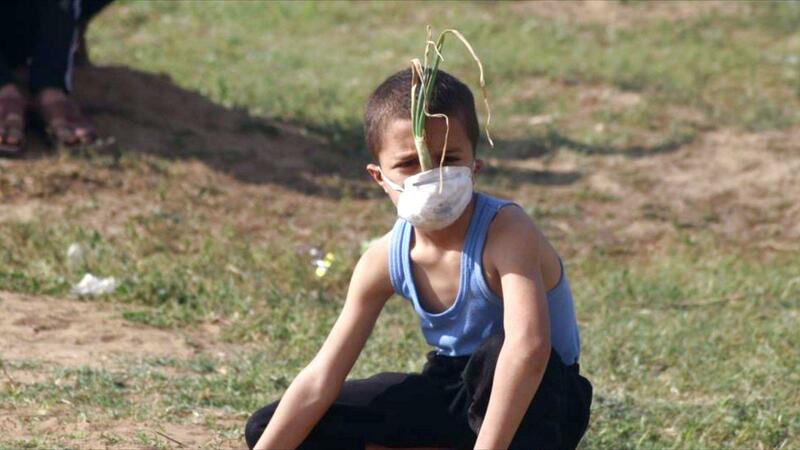 He heard his father, who was wounded in the first Palestinian Intifada [uprising] (1989), say that onions are the best solution to fight the effect of the gas. 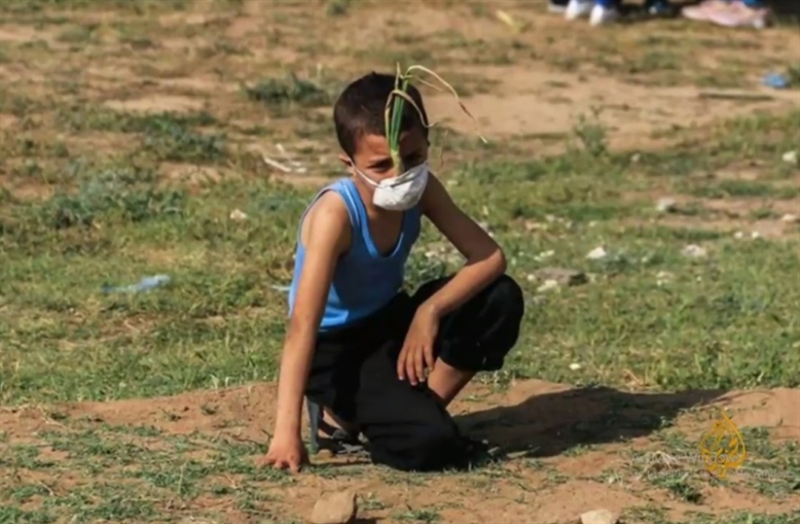 Although the “onion mask” is only made up of a medical facemask and an onion he picked from one of the agricultural fields, the child became an icon on social media, as well as among the Arab and international press. After his picture was taken by journalist Osama al-Kahlout, he was honored and hosted by various media and national bodies. “The onion mask” picture was recorded as one of the funniest, most innocent and challenging scenes. It was a piece of equipment the child had prepared in his bag along with pieces of potatoes because he was expecting that he would enter occupied Palestine on that day. Thinking that the stones thrown at the soldiers come only from refugee camps, he decided to stone the soldiers with potatoes! In this innocent manner, Muhammad recounted the events of that day. He became one of those who translated their actions into a simple language, the language spoken by the rightful owners before their occupiers, who are armed with all the instruments of death. What symbol can a picture of a limbless young man leaving his wheelchair and crawling across the eastern border of the Strip present? He chants sometimes, and throws a stone that won’t fall further than a few meters from his body at other times. That is what martyr Ibrahim Abu Thuraya, the first icon of the protests against the American declaration to transfer the US Embassy to occupied Al-Quds, did. 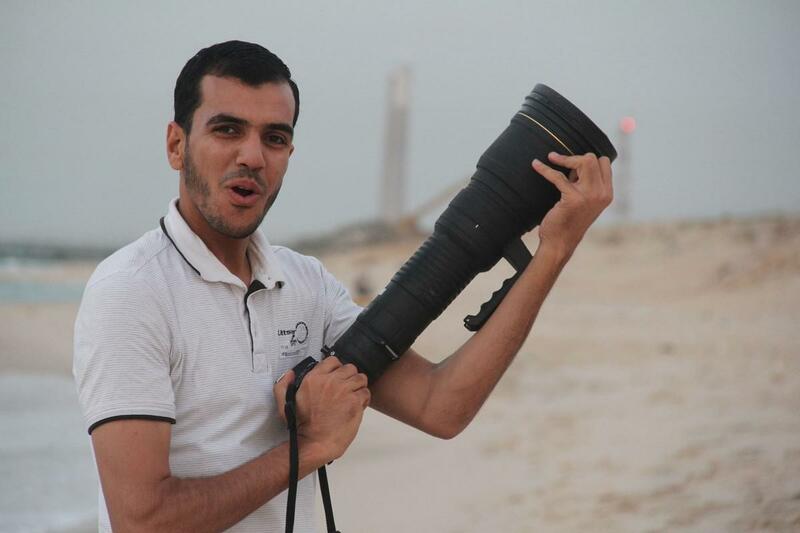 His picture and footage of his chants, which spread rapidly, was the beginning of the storm that his death caused on 15/12/2017. 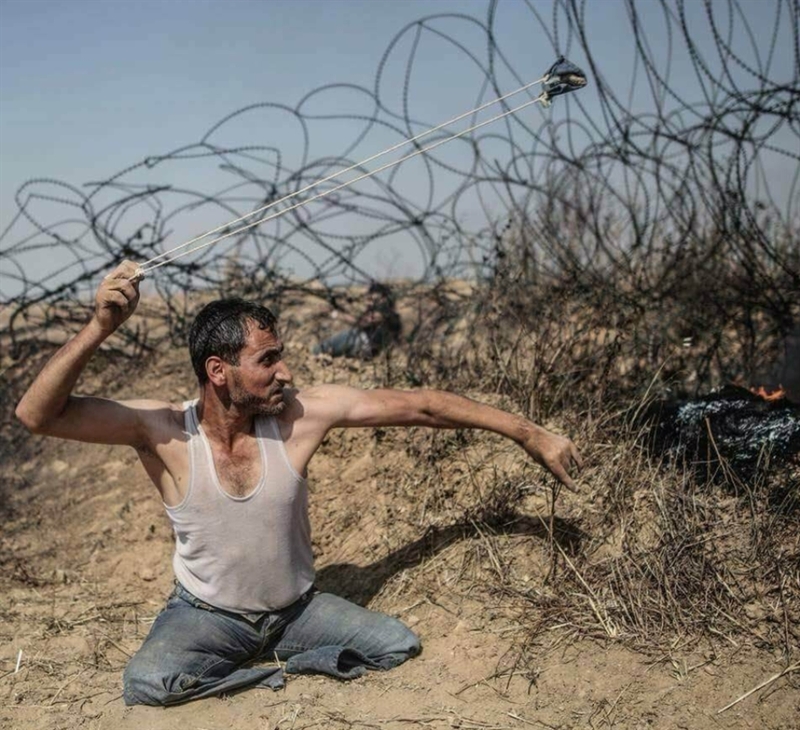 Abu Thuraya lost both legs in a bombing that targeted him in 2008. Despite his disability, he was keen to be the first attendee along the border since late 2017. The events of his martyrdom shocked the people in Gaza, as if he was telling them that they had no excuse when the wounded and the disabled head the ranks of the masses. Fadi Abu Salah was Abu Thuraya’s successor. He was not content with just a symbolic participation in rebellion against his disability. He was an active contributor to throwing stones and mobilizing the masses. As in his life, his martyrdom in 14/5/2018 marked a turning point in the Arab and international media coverage of the Great March of Return. His photos contributed to the continuity of the popular momentum. Courageous Razan’s story came to an end when an “Israeli” sniper decided to kill it with a bullet that penetrated her back. 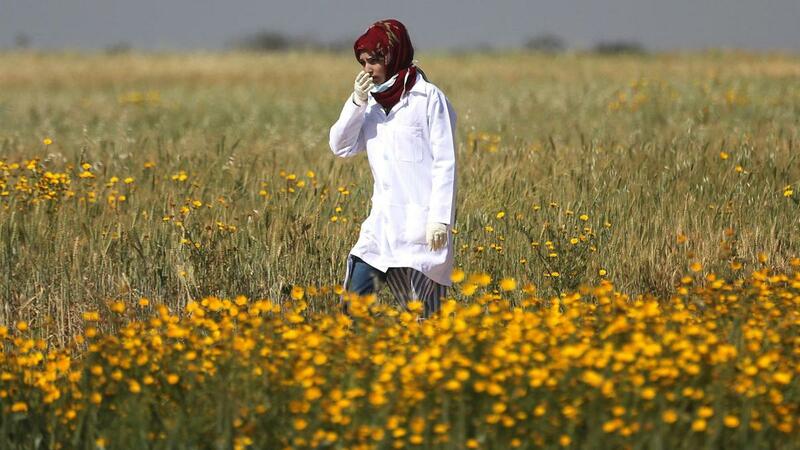 The young woman, who was an active volunteer in the medical relief organization, passed away. With her departure, she shed the light on the cause of targeting medical staff during the marches. 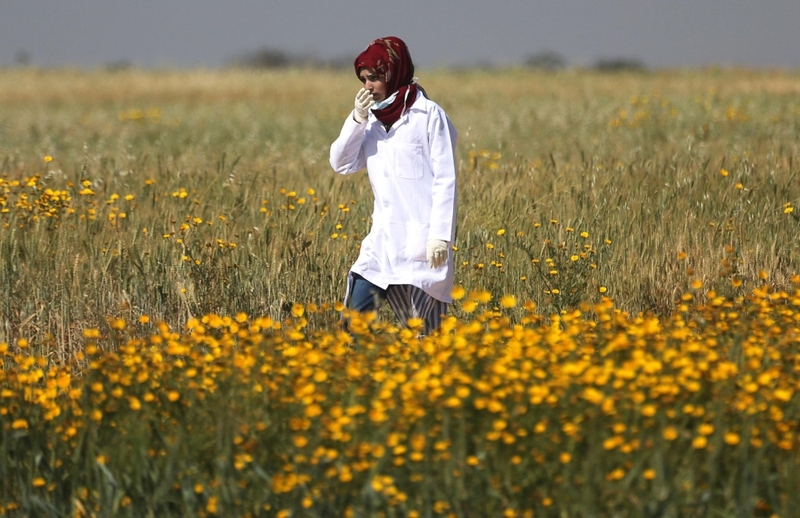 On the next Friday after her martyrdom, Razan’s mother wore her daughter’s medical coat and joined the marches with tens of Razan’s colleagues. «حتى ياسر نفسه لم يكن يتوقع أن تكون النهاية بهذه السرعة، ربما توقّع شكل الخاتمة، لكن في جعبته الكثير مما كان يريد أن يفعله»، هكذا يعلّق أحد أصدقاء الشهيد المصور ياسر مرتجى، مِمَّن عايشوه عن قرب. فمنذ اليوم الأول لـ«مسيرات العودة» لم يترك مرتجى الميدان: يراقب المساحة بين ما تقتنصه عدسة كاميراته، وما يصطاده قناصة الاحتلال. صاحب الأعوام الثلاثين التي قضاها في غزة، المدينة التي لم يشاهد سواها في حياته كما يقول، أبدع منذ بداية عمله الصحافي في أن يلتقط لها أجمل الصور التي تعكس شخصيته المتفائلة. «مبتسمٌ»، يقول زملاؤه الصحافيين، ويضيفون أنه من القلة الذين لا يلتقطون صورهم إلا وهم مبتسمون، ويعمدون إلى نشر مواد تثير الابتسامة والدهشة في آن واحد. في الشجاعية المدمرة عقب حرب 2014، سجّل شهادته في فيلم وثائقي سمّاه «الشجاعية الناجية»، الذي تدور قصته حول الطفلة بيسان التي أنقذها من بين الركام، ونشأت بينه وبينها علاقة وثيقة أهّلته لأن يكون صديقها الوحيد الذي رافقها في رحلة علاجها الجسدي والنفسي بعد استشهاد عائلتها. كان الشاب الطموح، مؤسس شركة «عين ميديا»، أول من التقط صورة لغزة بواسطة كاميرا طائرة، شاهدها سكان القطاع الذين لم يروا أرضهم يوماً من نافذة طائرة أو من ناطحة سحاب ليس لديهم مثلها، لكن من دون أن يعرفوا أنه كان هو من التقط الصورة. أصيب مرتجى ظهر الرابع من نيسان/ أبريل 2018، وجمع الدعاء القلوب في انتظار تحسن حالته، لكنه قضى في مساء اليوم نفسه، تاركاً برحيله أول «توقيع» إسرائيلي على الطواقم الصحافية، جسداً مسجّىً على أكتاف زملائه، صُوّر بواسطة كاميراته الطائرة. أثارت صورة الطفل، محمد عياش، فضول مختلف الوكالات العالمية. عياش، الذي لم يتجاوز الأعوام التسعة، قدّم براءة اختراع وتفكير في محاولة للتغلب على الغاز المسيل للدموع الذي يطلقه الجيش الإسرائيلي بكثافة على المتظاهرين، بعدما كان قد سمع من والده الذي أصيب في الانتفاضة الفلسطينية الأولى (1989) أن البصل هو الحل الأمثل للتخفيف من تأثير الغاز. ورغم أن «قناع البصلة» ليس سوى نبتة بصل التقطها من أحد الحقول الزراعية، وغطّاها بكمامة طبية، فإن الطفل صار بعد هذا المشهد أيقونة ضجّت بها وسائل التواصل الاجتماعي، فضلاً عن الصحافة العربية والدولية. فصورته، التي التقطها الصحافي أسامة الكحلوت، كانت سفيرة له لتكريمه واستضافته في مختلف الهيئات الإعلامية والوطنية. «قناع البصل» سُجّل كأحد أكثر المشاهد طرافة وبراءة وتحدياً، وكان واحداً من المعدات التي جهزها الطفل في جعبته، وإلى جانبه كان يضع حبات من البطاطا لأنه كان يتوقع أن يدخل في ذلك اليوم إلى فلسطين المحتلة. ولأنه اعتقد أن الحجارة التي ترمى على الجنود ابنة مخيمات اللجوء فقط، قرّر أن يرجم الجنود بالبطاطا! هكذا قدّم محمد سرديته البريئة عن أحداث ذلك اليوم، وصار من الذين ترجموا فعلهم بلغة البسطاء، لغة أصحاب الحق أمام محتليهم المسلحين بكل أدوات الموت. أي رمزية يمكن أن تقدمها صورة شاب مبتور الأطراف يترك كرسيّه المتحرك ويزحف على الحدود الشرقية للقطاع؟! يهتف تارةً، ويلقي حجراً لن يتجاوز جسده بأمتار في تارة أخرى. ذلك ما فعله الشهيد إبراهيم أبو ثريا، أُولى أيقونات الاحتجاج على الإعلان الأميركي لنقل السفارة إلى القدس المحتلة. صورته والمقاطع المصورة لهتافاته التي انتشرت سريعاً، كانت بداية العاصفة التي أحدثها استشهاده يوم 15/12/2017. أبو ثريا كان قد فقد كلتا قدميه في قصف استهدفه عام 2008، ورغم ذلك حرص على أن يكون أول الحاضرين على الحدود منذ نهاية 2017. أحدث استشهاده صدمة تفاعل معها الشارع في غزة، كأنه قال برحيله للجماهير إنه لا عذر لأحد حينما يتقدم المصابون والمقعدون صفوف الجماهير. كان فادي أبو صلاح خليفة أبو ثريا الأول، إذ لم يكتفِ بالمشاركة الرمزية للتمرد على العجز، بل كان مساهماً فعالاً في رجم الحجارة وتعبئة الجماهير. وكما في حياته، مثّل استشهاده يوم 14/5/2018 حدثاً فارقاً في التغطية الإعلامية العربية والدولية التي نالتها «مسيرات العودة»، وأسهمت صوره في استمرارية الزخم الشعبي. يمكن زائرَ منزل الشهيدة رزان النجار، في حيّ خزاعة شرقي مدينة خانيونس (جنوب)، أن يفهم أنه ما كان يمكن الحصارَ والحروب المتكررة إلا أن تدفع شابة في عمرها إلى القناعة بأن وجود الاحتلال هو سبب أزمتها كما كل أبناء جيلها. والفقر الذي أورثهم البساطة والتمرد والفداء هو العامل المشترك الذي جمع بين رزان والآلاف الذين داوموا على الحدود الشرقية للقطاع. ابنة الواحد والعشرين ربيعاً، التي عُرفت بجرأتها ونشاطها في تقديم المساعدة الطبية الأولية إلى المصابين في الميدان، بدت مقتنعة بما تقوم به، حين قالت: «أنا هنا على خطوط التماس، أُشكّل درعاً بشرية… جئت إلى هنا وقد امتلكت الجرأة والقوة لأنقذ أرواح إخواننا، ورغم تعرضي للإصابة والكسر في يدي، رفضتُ أن أضع الجبيرة حتى لا تعوق حركتي». انتهت حكاية رزان الشجاعة من وجهة نظر القناص الإسرائيلي بطلقة اخترقت ظهرها. قضت الشابة التي نشطت في «منظمة الإغاثة الطبية» تطوعاً، وسلطت برحيلها الضوء على قضية استهداف الطواقم الطبية التي لم تسلم خلال المسيرات. في الجمعة التالية لرحيلها، كانت أم رزان تلبس معطف ابنتها الطبي، وتنضم إلى المسيرات برفقة العشرات من زميلاتها المتطوعات. Palestinians staged a general strike in the Gaza Strip on Saturday amid planned mass protests marking the Land Day and the first anniversary of rallies against the decades-long Israeli occupation. Schools, shops and public institutions closed their doors across the blockaded territory, according to an Anadolu Agency correspondent in Gaza. The general strike comes as thousands of Palestinians began to converge on the Gaza-Israel buffer zone on Saturday to take part in the Land Day rallies, which mark the killing of six people by Israeli forces in 1976 during demonstrations against the seizure of Arab land in Galilee. On Friday, Palestinian resistance groups Hamas and Islamic Jihad warned Israel against attacking protesters during the planned demonstrations.